There are a few very specific TOEFL speaking mistakes that many students make on their TOEFL speaking tasks. Out of the thousands of students we’ve helped with English Simple TOEFL, I would say that 80% of my students struggled the most with the SPEAKING section on the TOEFL. Is it the most difficult? NO. But many of my students fail because they make a handful of (easily avoidable) mistakes. 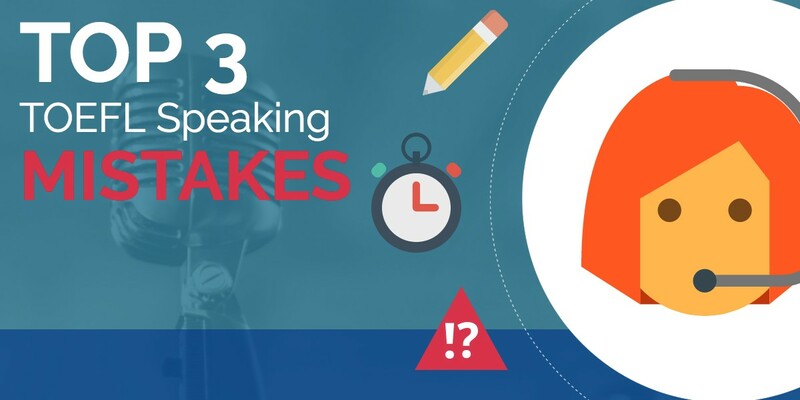 Because of this, I have listed below what I think are the TOP 3 MISTAKES students make on the TOEFL ibt SPEAKING section. Many of my students claim that because it’s a speaking section, they don’t need to write or organize notes. They think that they can simply use their spoken English skills to answer the question and that will get them a good score. The secret of the TOEFL ibt is that it isn’t a test of ENGLISH, but a test of how well you can organize and deliver your thoughts IN ENGLISH. Because of this, a simple, consistent NOTE TAKING STRATEGY is KEY in scoring well on the TOEFL ibt. 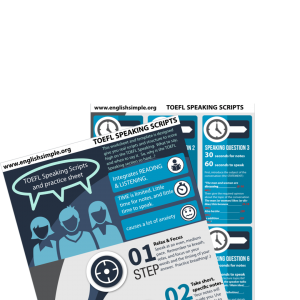 The English Simple program bases all strategy on careful, simple note-taking. See the video below for an introduction to our note-taking strategy. Speaking in another language makes us nervous. Taking tests makes us nervous. Combine the two? You have a whole lot of “NERVOUS”! And what do we do when we feel nervous? We speak quickly. This is a big mistake on the TOEFL ibt SPEAKING section. 1) It will make your answers more understandable and improve your score. 2) It will allow you to fill the time appropriately without running over time OR finishing too early. There’s always that moment right at the beginning of a TOEFL SPEAKING question when the BEEP sounds and the recording starts and you are asked to…speak. But nothing comes out. You freeze. Guess what? Everyone does. There’s a lot of pressure when you’re asked to speak like this. It is a very common problem for my TOEFL students. But I have a trick. REPEAT THE QUESTION when you BEGIN SPEAKING. 1) It starts your answer out strongly, with perfect grammar, and directly answering the question. It’s the perfect “first impression” for the grader. 2) If you know exactly what to say the second the beeper “BEEPS”, there’s no way you can “freeze”. And the rest is just following your notes. Adam is the founder and lead instructor for the English Simple TOEFL program. He's taught English and TOEFL for over ten years, and developed curriculum all over the world. TOEFL is his business, but helping people is his passion. His "office" is always open, so feel free to drop him an email with any questions, complaints, compliments, or funny jokes. He speaks French, Spanish, Japanese, and Russian. But you gotta write him in English - you're prepping for the TOEFL!